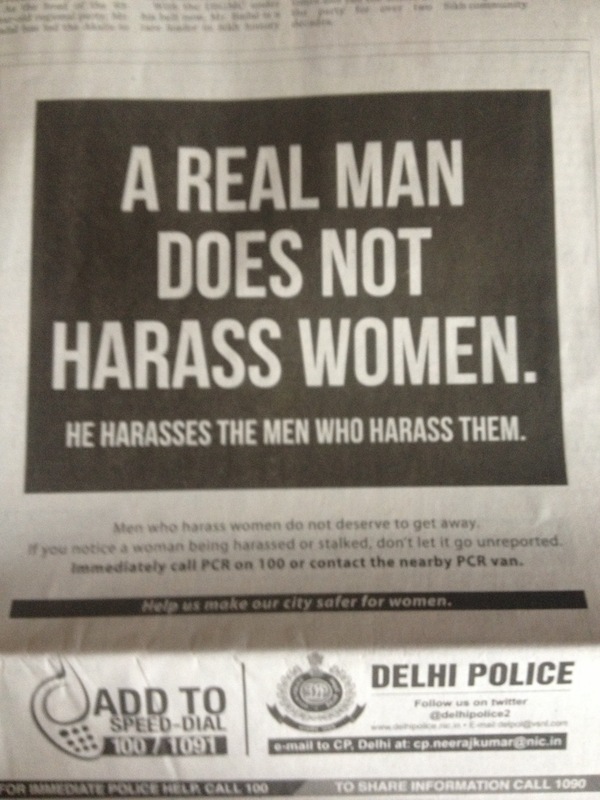 This ad is in the papers this morning and its good to see the police sending out a strong message about something that has really become a talking point in Delhi and where the police have taken a huge beating to their reputation. In a presentation to the LG, DDA body UTTIPEC had suggested pro active campaigns that used images of men to reinforce that men need to take the initiative on an issue like violence against women as opposed to constantly showing a woman as a victim. Looks like the suggestion was well taken. I am a bit concerned about the copy here though. It suggests that men should take personal action (beat them?) against perpetrators of crimes against women. It’s only the small print that clarifies that the suggestion is for men to report other men who they observe committing such crimes! While I think it’s a great idea to start a campaign that calls on citizens to partner with the police, I am not sure this sends out the right message! Comments anyone? 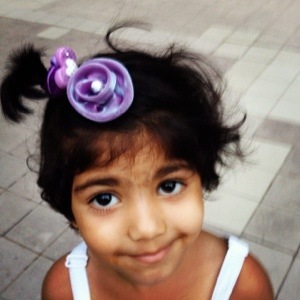 Aadyaa does not know what a cigarette is and am I glad about that! Stupid me brought cigarette smoking up in a conversation and met a blank stare! This is how it happened. So I had to say something to stem this tide. I have experience in conditioning the minds of children with respect to advertising about which I have very strong views! Udai had once wanted to have Complan and not Bournvita with his milk. Maybe it was the other way around, how does it matter? So I sat him down and told him advertising (mostly) was paid for by profit making companies to influence our minds so that we buy their product not their competitors. I also went on to say that brands targeted children as agents to influence buying decisions of adults who are parents, grandparents, aunts and uncles of impressionable and demanding kids! Also that claims made in ads may or may not be true. He bought the arguments entirely, to the extent that he started drinking his milk without either of those additives! And still does! This set of conversations also taught him not to accept everything at face value and not get carried away by gloss and glamour, to evaluate information and think it through. Today I told Aadyaa all of that. And then I tried to give cigarettes as an example. That it is bad for health but advertisements can influence people to smoke! And there’s where I hit a dead end. I was thinking about my childhood. Things have changed now. Cigarette smoking is no longer the iconic cool thing it was, at least I hope so. Not only is there no advertising permitted for cigarettes and alcohol, smoking is banned from public places. So Aadyaa simply doesn’t know what a cigarette is! Blissfully oblivious. I don’t know what that means for her adult life and I am hoping it is a positive thing. But I need to find another example to revisit the advertising discussion. She is a tougher nut to crack, but I am getting there slowly! I have cracked through the obsession with girlie pink (also a sad stereotype created by branding and ads) and got her to appreciate the rest of the colour palette. I will convince her to see ads in a balanced way as well. The battle is on!